Cuprite is a copper oxide mineral that forms in the oxidized zone of copper sulphide deposits, along with native copper, chrysocolla, malachite and azurite. Most crystals of cuprite are too small to cut as faceted gemstones, but some rare large gem-quality crystals have been found in Namibia. These unusual and striking gems are extremely rare and much sought after by collectors. Cuprite is sometimes known in the gem trade as red copper for its distinctive red color. 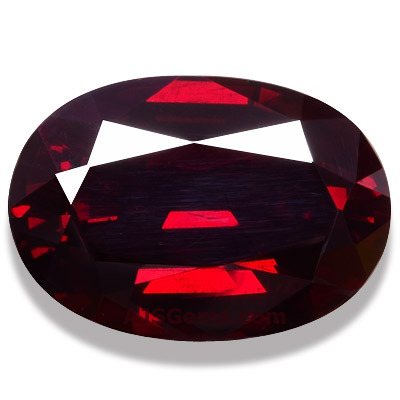 The most typical color for cuprite is carmine, a deep red with a very slight purplish tinge. Cuprite tends to be translucent rather than transparent, and some specimens are such a dark red that they can appear almost black in some lighting. Gemologically, cuprite forms in cubic or octahedral crystals, and it is one of a small number of singly refractive gems (along with diamond, spinel and garnet). But cuprite is quite soft, with a hardness rating on the Mohs scale of 3.5 to 4, in the same range as fluorite, sphalerite and rhodochrosite. Cuprite does have a very high refractive index of 2.849, higher even than diamond (2.417 - 2.419). Though most gems with high refractive indices are the harder gems -- such as diamond, demantoid garnet, zircon and corundum -- there are some softer gems like cuprite, sphalerite and sphene that also rank high for refractive index. 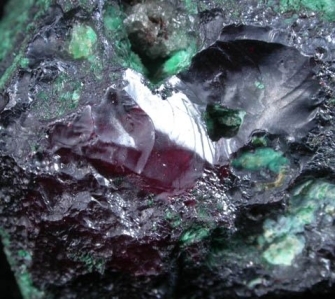 Cuprite also has superior luster, graded as admantine or submetallic. Cuprite has another interesting property -- it is extraordinarily dense, with a specific gravity of 5.85 to 6.15. To put this in perspective, colored gems which are denser than diamond (3.50 to 3.53) are always notable. The most famous ones are corundum (ruby and sapphire) with a density of 3.95 to 4.03 and zircon with a density of 3.93 to 4.73. But cuprite is in a different class all together, with a density 75% higher than diamond. Virtually all of the gem-quality cuprite in facetable sizes came from a single unique deposit in a copper mine in Onganja, Namibia. The largest crystals of cuprite in the world, up to 14 cm in diameter and 2.1 kg in weight, came from this mine. These crystals were typically coated with a thin layer of malachite and were discovered in 1973. Crystals measuring 6-8 cm, not as large as the record-size specimens, but nevertheless enormous for the species, were not uncommon. Virtually every faceted cuprite gemstone over one carat in weight is from this single deposit. Since the mine is now depleted, fine cuprite specimens are sought after by collectors.